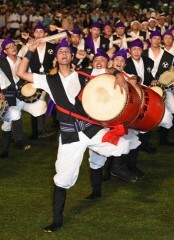 The male members of the Yamazato Youth Group of Okinawa City brought the festival to a close by performing a lively Eisa dance at Koza Athletic Park in Okinawa City on August 17(Photograph taken by Masatoshi Moromizato). The 59th Okinawa Zento Eisa Festival was held at Koza Athletic Park in Okinawa City from August 15 to 17. Fifteen Eisa organizations from in and outside the city took part in the festival and attracted spectators to various performances. Many families and tourists visited the park from in and outside Okinawa. According to the event organizer, 310,000 visitors enjoyed the festival over the three-day period, which included a michijune parade. To bring the festival to a close, the members of the Yamazato Youth Group of Okinawa City performed a lively Eisa dance that incorporated karate Kata. The spectators applauded, and cheered the performers.